I could not comment on whether the Gospel of Judas has been translated correctly or not. But I can comment that the story of Judas in the canonical Gospels has not been presented accurately by scholars. Judas is not quite the villain in the Gospels that scholarship has long made him out to be. That is simply a false claim. Certainly, this is the case with Mark. Too many scholars still overlook the fact that Mark (and the other Gospels) does not use the Greek word for betray, "prodidomi", to describe Judas' act. He uses a neutral word, "paradidomi". The word is not translated as betray in other places, e.g., at Mark 15:1 where Jewish leaders deliver (i.e., transfer) Jesus to Pilate and at 15:15 where Pilate transfers Jesus to the soldiers. Both times Mark uses a declension of "paradidomi". So what would justify translating it as betray when Mark uses it with Judas? Nothing. Mark presents no motive for Judas, no conflict between Judas and Jesus or other disciples, and no recriminations against him after the deed is done. No one in the Gospel ever says a bad word about him. Marks is missing every single feature of a story of betrayal. Tradition, including scholars, reads betrayal into the text and then claims to have found it there. You have to radically alter the evidence to make it tell a story of betrayal. The so-called betrayal by Judas is founded on accusation and assertion, not on evidence. Betrayal is not even a fact or datum in the text. It is pure theory — a theory that fails to explain the evidence. To get around this, scholars misrepresent the betrayal as a piece of evidence in the text. And that is so wrong. You cannot rewrite the Gospels and then claim this is good scholarship. My apologies for coming rather late to this whole discussion, although I do have a connection: I worked at National Geographic magazine for many years. When Joan Acocella writes: "If the gospel was truly the earth-shaking document that the National Geographic Society claimed it was—if it promoted Judas from villain to hero—then to have him denied admission to Heaven would be decidedly awkward." Does the pattern of translation inconsistencies in the first edition suggest to you that the story line was fixed ahead of time? That is, if you pay top dollar for such a text, then you better come up with an amazing story? My Greek New Testament interlineal shows that the words Jesus uses for "betray" in Mark 14:18 and 21 are very different from the words "deliver" in Mark 15:1 and 15. The translation given in Mk 14:18 is "Jesus said: 'Truly I tell you that one of you will betray me, the [one] eating with me.'" This is followed by the most ominous statement in v. 21, ". . .But woe man to that through whom the Son of man is betrayed; good for him if was not born." (Literal translation.) In Mk 14:44 we also find a different word from that in Mk 15: 1 and 15. It states literally: "Now had given the [one] betraying him a signal . . . ."
Though I do not know Greek it appears from the above that the almost unanimous scholarly agreement in translating the words as betray or deliver in the above passages is correct. Nor do the contexts show Judas to be any nice guy. The NT is the perverted words of its editors. Judas was the real prophet. He was made the villain. Its as simple as that. Who writes history, especially ancient history? And those writers were inventive with the Greek. Raymond Brown, a highly conservative scholar, insisted (his word) that "paradidomi" cannot be translated as betray. He was, in fact, very specific that it cannot be translated as betray when used with Judas. He still believed Judas was a traitor, but he had to admit that the word used created a problem. His explanation was that Mark wanted to show some kind of unity in responsibility among those who had transfered ro conveyed or delivered Jesus from one to another — so Judas conveys Jesus, then the Jewish leaders, then Pilate conveys him to the soldiers. It would take too long to explain here why this is not a good explanation offered by Brown. My point is only that the first order of business is to get the facts or data correct. Translating as betray is an incorrect fact as Brown admitted. And so have many other scholars. My other point is that Judas is convicted on the basis of erasing evidence and rewriting ambiguous evidence into unequivocally negative evidence. That relgious tradition did this and continues to insist on mistranslations is not so surprising. What is shocking is that academic scholarship continues to do this. Too many scholars still do not even mention that betray might be a mistranslation. They just ignore what a majority of scholars now admit about "paradidomi". They also misrepresent the betrayal as a fact when it is really a theory. Judas has been convicted on the basis of emotions, hostility, prejudice, and brute power, but not on the basis of the evidence or reason. I find it ironic that some scholars would complain that since the Holocaust, there has been a movement of sympathy towards Judas, while these same scholars never say a word about the atmosphere of hostility and prejudice which is still in operation among scholars. Hostility is okay but not love or sympathy. Scholars rewrite the evidence based on their emotions and no one says a word about it. "Who writes history, especially ancient history?" Sounds to me like Geoff Hudson writes it. Leon, if your are to claim that "Judas is convicted on the basis of erasing evidence" then you must have seen or have evidence of what was actually erased. Can you provide the words that were erased and how did you come by them? So why not "read between the lines"? The evidence is there if you look for it. It is inevitably complicated. The editors were good at covering their tracks. The trouble is that if you get rid of Jesus, the biblical academics are out of a job. Not only that, but they have been wrong for 2000 years. Judas was the central character who was supposedly responsible for the "revolt". Well that is true, but it was not he and his followers who revolted, it was the priests who were provoked by Judas's "philosophy". Judas was responsible for introducing a "system of philosophy which we were before unaquainted withal". Of course arguments like "then you must have seen or have evidence of what was actually erased", is a unhelpful response typically used by academics. We have what we have. It is fairly obvious that much of it has been fabricated. Deciding what is valid and what is not is an exercise in reverse editorial or deletion. That is the best one can do. To continue as though it was all true (and for example, argue over whether paradidomi meant betray or was a neutral word) is almost a waste of time. How I rewrite history, with a more probable outcome. The principal of the prophets must have been Judas who was "taken alive". The scene (Ant.18.4.1) in the temple, was made by editors into the scene in the Garden of Gethsemane. 1.But the prophets did not escape without tumults. Caiphus was one who thought lying a thing of little consequence, and who contrived every thing so that the prophets might be displeased; so he bid them to get together at the sanctuary, which is by them looked upon as the most holy of all places, and assured them, that when they were come thither, he would show them those sacred stones which were laid in that place, because he put them there. So they came thither armed, and thought the discourse of Caiphus probable. They desired to go up to the sanctuary in a great multitude together; but Caiphus prevented their going up, by seizing upon the courts with his guards; and when it came to an action, some of them they slew, and others of them they put to flight, and took a great many alive, the principal Judas, Caiphus ordered to be slain. 2. The prophets sent to king Agrippa, and accused Caiphus of the murder of Judas. So Agrippa ordered Caiphus to go to Rome, to answer before the emperor to the accusations of the prophets. So Caiphus made haste to Rome, and this in obedience to the orders of Agrippa, which he durst not contradict; but before he could get to Rome, Tiberius was dead. 3.But Agrippa released the prophets of Jerusalem from all the taxes upon the fruits that they sold, and gave them leave to have the care of the high priest's sacred stones, and to have them under their custody in the temple, which power they used to have formerly. Agrippa also deprived Joseph, who was also called Caiphas, of the high priesthood, and appointed Jonathan the son of Ananias, the former high priest, to succeed him. I you don't believe that Ant.18.4 has been obfuscated, just take a look at what is immediately before it in Ant.18.3 about Paulina and Mundus. Ant 18.3 also includes the Testimonium Flavium. At the end of Ant.18.4, Joseph Caiphas was removed from the high priesthood, a fact of great significance. But the Flavian editors had it at the end as incidental. Vitellius was yet another example of Flavian obfuscation. Agrippa was king at the time. Jewish records only have one king Agrippa, Agrippa the Great. He was a supporter of the prophets. Agrippa was appointed king in Ant 18:1. He was changed to Cyrenius who had already been covered in Ant.17.13.5. We now know why there is "stone" language in the NT - the temple "stones" and the "stone that was rejected". It was started by the prophets seeking to have the high priest's sacred stones in their safe keeping. The origin of 'everyone deserted him and fled' (Mark 14:50) is: "and others of them they put to flight" of Ant.13.4.1. So the answers to the problems of Judas have been right there under scholars noses for 2000 years. One obvious thing about the wrtings attributed to Josephus is that War Chapter 1, and a good deal of War Chapter 2, should be in Antiquities. War was intended to be about the "revolt". Was Judas in fact Judas Maccabeus? Was it he who introduced "a new philosophy". who hearing of the power of the Romans, and that they had conquered in war Galatia, and Iberia, and Carthage, and Libya; and that, besides these, they had subdued Greece, and their kings, Perseus, and Philip, and Antiochus the Great also; he resolved to enter into a league of friendship with them. He therefore sent to Rome some of his friends, Eupolemus the son of John, and Jason the son of Eleazar, and by them desired the Romans that they would assist them, and be their friends, and would write to Demetrius that he would not fight against the Jews. So the senate received the ambassadors that came from Judas to Rome, and discoursed with them about the errand on which they came, and then granted them a league of assistance. They also made a decree concerning it, and sent a copy of it into Judea. It was also laid up in the capital, and engraven in brass. The decree itself was this: "The decree of the senate concerning a league of assistance and friendship with the nation of the Jews. It shall not be lawful for any that are subject to the Romans to make war with the nation of the Jews, nor to assist those that do so, either by sending them corn, or ships, or money; and if any attack be made upon the Jews, the Romans shall assist them, as far as they are able; and again, if any attack be made upon the Romans, the Jews shall assist them. And if the Jews have a mind to add to, or to take away any thing from, this league of assistance, that shall be done with the common consent of the Romans. And whatsoever addition shall thus be made, it shall be of force." This decree was written by Eupolemus the son of John, and by Jason the son of Eleazar, when Judas was high priest of the nation, and Simon his brother was general of the army. And this was the first league that the Romans made with the Jews, and was managed after this manner." Greek king Antiochus. It seems that the Romans didn't keep their side of the treaty. Secondly, what was Judas's philosophy? Well Alcimus the high priest wanted to destroy the sanctuary. He received "a stroke" that made him fall to the ground. The "people" (presumably those on Judas's side) made Judas high priest. The point was that Judas was pro sanctuary. I am not sure why you are asking me about erased evidence. We have communicated about this here and elsewhere before. You are a religious or traditionally minded person who wants to make sure that not one iota of the traditional story ever changes. I don't mind that. I have no quarrel with those who have a religious point of view. Religious people (most, not all) are not bound by rules of evidence or morality. They believe what they believe. They don't need evidence. Evidence is irrelevant. I address myself only to people who claim to be historical scholars or who claim to be interested in such scholarship. For them, the rules of evidence must apply. You cannot erase or rewrite or misrepresent the evidence. It is an absolute fact that paradidomi is not translated as betray most of the time. It is translated as betray only for Judas. Every so-called historical scholar has a duty to report that. 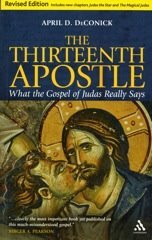 When Elaine Pagels writes about Judas in her recent essays (in "Reading Judas" co-authored with Karen King), she never once mentions that the Gospels use paradidomi and that betray at the very least might be a mistranslation. This is erasing evidence. Bart Ehrman does something similar. He mentions paradidomi one time in connection with Paul's use of it. He says betray is probably the wrong translation and argues against translating it this way when Paul uses it. But when he turns to the Gospels, he never tells his readers that the Gospels use the same word. This too is erasing evidence. It is astounding that anyone could write about Judas in the 21st century and fail to mention this. So when Joan Acocella writes her article in which she refers to Pagels and Ehrman, she too of course never mentions paradidomi. If this kind of thing does not bother you, then you are not seriously interested in the question of erasing evidence. And that's okay. I do not expect the traditionally minded to care about any of this. But for historical scholars, it is a terrible thing. At Matt 26:50, the RSV has Jesus say to Judas, "Friend, why are you here?" That is an incorrect translation. The NRSV gets closer with "Friend, do what you are here to do." That is still not quite correct. It is still erasing the evidence. What the Greek really says and what we know about it from another example of it in Greek is really fascinating. But only if you love history and the study of evidence. I know some reliigous people want to maintain a semblance of evidence, but they do not really need anything of the kind. For the genuine historian, it is very different. The actual evidence is exciting. It makes your skin tingle. For relgious people, beliefs come first and nothing must be allowed to disturb that. But I am on a very different track. I am not interested in attacking religious beliefs. I never do so in any of my work. I criticize only historical scholars who use beliefs and emotions to trump the true study of the evidence. These scholars substitute data with spin for the pure data. But the goal of real scientific scholarship is to set out the actual data without spin and see where this leads us. I have now reached the conclusion that all memories of the various Judas's throughout the writings attributed to Josephus, the NT, and the Gospel of Judas, are memories of Judas Maccabeus. So what was his "system of philosophy, which we were before unaquainted withal." (Ant. 18.1.1.). "Accordingly, as I have elsewhere formerly declared, I will now give a particular account of what concerns this king - how he subdued Judea and the temple; for in my former work I mentioned those things very briefly, and have now thought it necessary to go over that history again, and that with great accuracy." Such phraseology is typical of Flavian Roman editors in the writings attributed to Josephus. The king was Antiochus. One can expect anti-Greek propaganda. Also the editor makes out that Antiquities was written after War. The editor had to go over the existing history because he hadn’t got the time when he edited War. His “great accuracy” was the propaganda he introduced into Antiquities. Ant. 12.5.2.- "Accordingly, as I have elsewhere formerly declared, I will now give a particular account of what concerns this king - how he subdued Judea and the temple; for in my former work I mentioned those things very briefly, and have now though it necessary to go over that history again, and that with great accuracy." Such phraseology is typical of Flavian Roman editors in the writings attributed to Josephus. The editor makes out that Antiquities was written after War. The king was Antiochus. One can expect anti-Greek propaganda. Also He had to go over the existing history in Antiquities because he hadn’t got the time when he edited/created War. His “great accuracy” was the propaganda he introduced into Antiquities. Antiochus’s punishment which he threatened to the disobedient; “on which account they every day underwent great miseries and bitter torments; for they were whipped with rods, and their bodies were torn to pieces and were crucified while they were still alive and breathed.” (Ant.12.5.4) This was done with the approval of the high priest Onias (Menelaus) and the sons of Tobias who had gone complaining to Antiochus about Jesus (Jason) the former high priest who had raised a sedition against Menelaus. (Ant.12.5.1). What did Antiochus do when he came to Jerusalem? (Ant.12.5.3). First he was let into Jerusalem by “those of his own party”, presumably by supporters of Onias (Menelaus), and “slew many of the opposite party”, presumably those supporters of Jesus (Jason). He “took away the golden candlesticks, the golden altar and the veils.” (Ant. 12.5.4) The target was the sanctuary. The religious issue was the sanctuary. It also says he took away “the altar”, meaning the altar for burnt offerings. But look further down. It says “when the king had built an altar upon God’s altar” - the king hadn’t removed the altar for burnt offerings. Nor did he slay swine upon it. The slaying of swine and the setting-up of idol altars was pure propaganda on the part of the Roman Flavian editor. Thus the issue was a simple one; animal sacrifice versus the sanctuary. The sufferings of the "Jews" on the side of Jesus (Jason), under king Antiochus, looks like the sufferings of the "Essenes" under the Romans. The passage about Essenes is in a fabricated passage that includes the Pharisees and Sadducees and the fourth philososophy. (War 2.8.10). One could well believe that the “Essenes” and the “Jews” on the side of Jesus (Jason) were one and the same. The Flavian editor had merely taken his information from the original Antiquities. Thank you Leon for clarifying for me who you think is doing the "erasing," and what you mean by that. It's the contemporary scholars, Pagels, Ehrman, etc. you are specifically targeting. But, the ancient scholars, theologians, and translators who were experts in the Greek language apparently came to the same conclusions since Judas has always been seen as a traitor. As I noted in my July 31, 2009 11:37 PM comment, the words for betrayal in Greek are also different in the varied cited passages. I'm interested in these statements and conclusions, but what can I say? It's all Greek to me. Nevertheless, most of the scholars both ancient and contemporary disagree with you. As for your comments about my personal beliefs, they are completely wrong. If you form conclusions about scholarly matters the way you do about people you are clearly in the realm of wild speculations. Thank you Geoff Hudson for steering me into reading more of Josephus. He may have borrowed a lot from Luke and other NT writings. I can't comment on the barrage of statements you make. Apparently no one else can either. "He may have borrowed a lot fom Luke and other NT writings?" More likely is the possibility that the editors of Luke, and the writings attributed to Josephus, were one and the same. I have come to the conclusion that the Gospels are largely fabricated. But there are hints in them of the prophetic movement that underlies them. I had thought that Judas in the gospels was a reality. But now I think that the Judas in the Gospels, along with Jesus are fabricated. However, I still think that the pauline literature is based on actual original documents of the prophetic movement. In Ant.18.1.1, Judas of Gamala is Judas Maccabeus redivivus. He was fabricated to give Flavian Roman historians an explanation of their war and their destruction of the temple. Many of the things said about Judas of Gamala come from Judas Maccabeus. (Ant.12.Chaps.6-11). Judas of Gamala never existed. The point, José, is curiosity about the evidence. You have indicated that you are not interested and are not fascinated about the use of paradidomi and its meaning. You were not even curious about what the Greek words at Matt 26:50 actually say. You never asked. That is quite telling. And I don't mind that. Whether you call yourself religious or anything else, it's clear you are more interested in not paying attention to the evidence. And you have no obligation to do so. But I strongly object to anyone trying to pass off such a lack of interest as scientific or historical scholarship. Religious people and theologians and an assortment of others can trash the entire Bible if they want to. Evidence means nothing to them, only beliefs. That's okay. But a genuine scholar cannot trash even one small part of the Bible. I am not trying to prove to you that Judas did not betray Jesus. You have shown yourself to be impervious to proof. All I am interested in doing here is to point out how exciting the actual evidence is. Not for you, okay, but to scientists and historians, nothing is more exciting than the evidence. Ancient theologians made a lot of mistakes in "reading" the Bible. Modern scholars repeat many of them. They are not reading. They are imposing their emotions and beliefs on the Bible. Hostility and prejudice convict Judas (and Jewish leaders), not the evidence. Negative emotions are rarely helpful in solving any historical problems, but it goes on and on today. This may suit you, but it is not true scholarship. Despite your attempts at slight insults and to carp and to be snide, nothing can change the fact that love of evidence and exploration of evidence has a right to exist. Just to add one thing. German scholar Hans-Josef Klauck (I hope I have his name right; I couldn't remember it, when I was typing the last post) pointed out in his book on Judas that the ancients made a wrong decision when they interpreted paradidomi as betray. He called it a questionable interpretation of the text. We've been stuck with that bad, inaccurate translation ever since. Klauck went on to say that we don't need psychodynamics to understand Judas, but scholars do need it to understand themselves and why they scapegoated Judas. Klauck is so right about that. Failure to point out the actual evidence (never even mind what is the right interpretation of it) is a sign of how badly scholars still want to scapegoat Judas. Poor old Leon has written a book. A fatal mistake. Now he spends the rest of his life justifying it. "and so is the belief that we can combat it by correcting our holy books." I am not quite sure what Joan Aocella means by this. Does she imply that all the NT documents were completely fabricated? If she does, then I would disagree with her. Or does she imply that there were original documents that were edited or developed out of recognition. In that case also, I have to disagree with her. There is certainly something to be made out of the Gospel of Mark, but without Jesus and his trips to Galilee. The Gospels of Matthew, Luke and John are probably completely fabricated. Some of the the pauline epistles undoubtedly have an original form. The original epistles did not mention Jesus or the mission to Gentiles or the journeys of Paul to Gentile areas. They were all written from Rome to the prophets of Jerusalem. And Acts took place in Rome, except for the final sea journey back to Caesarea, and Jerusalem (the reverse of the extant document). Yipes! Talk about "fabricating," we seem to have some very creative novelists around here. Dan Brown could certainly get some good leads from reading some of the commentators on this blog. Hmm. Hint. Dan is the one who out fabricates Pagels in hermeneutics fantasy. Only difference, Brown is a novelist.